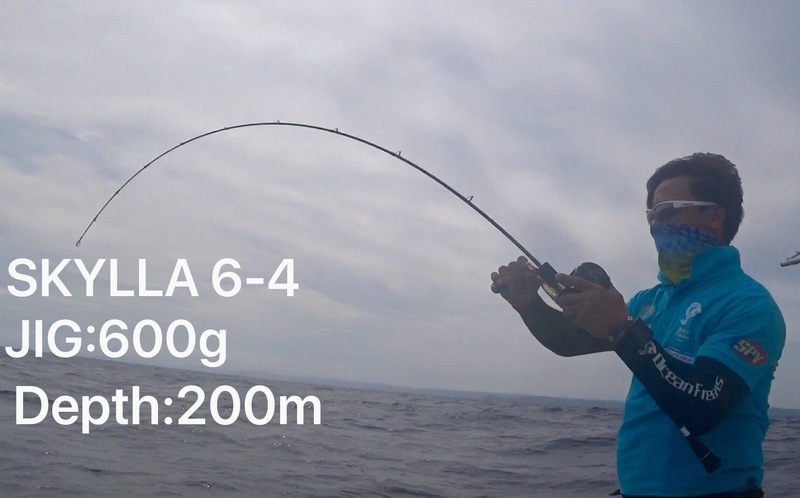 Fishing rod Skylla developed by Oceanfreaks will be introduced in the market soon. We have visited various fishing grounds in Japan and around the world to gather all the relevant information and data in our development of Skylla. 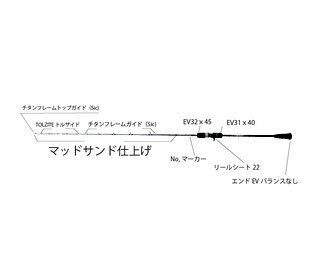 We have produced a new concept slow jigging rod which caters for slow jigging either in rapid current flow, static anchored or drifting with current. 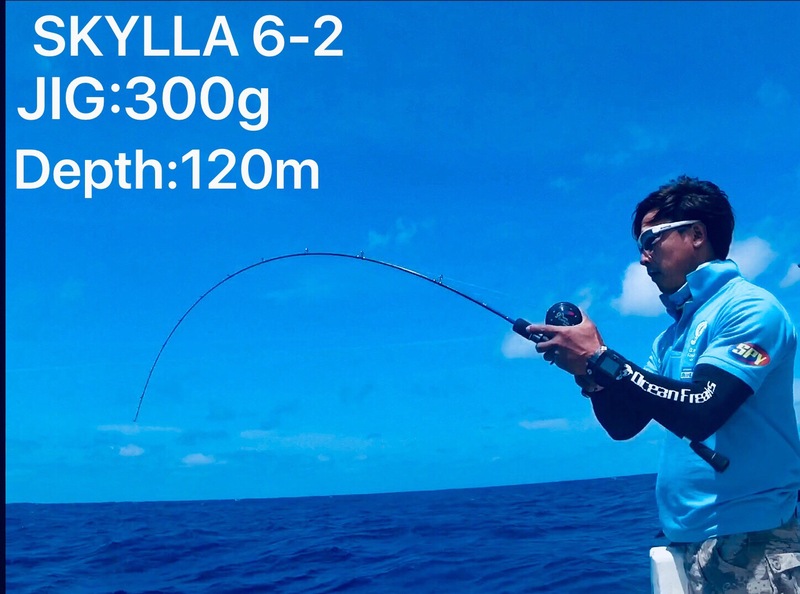 Skylla slogan is “jigging with passion”, meaning utilising the strong and powerful rod shaft to transfer the energy from our arms to the jig, then rely on the sensitive rod tip to feel the jig’s movement. Skylla will allows you to play the jig within your control. 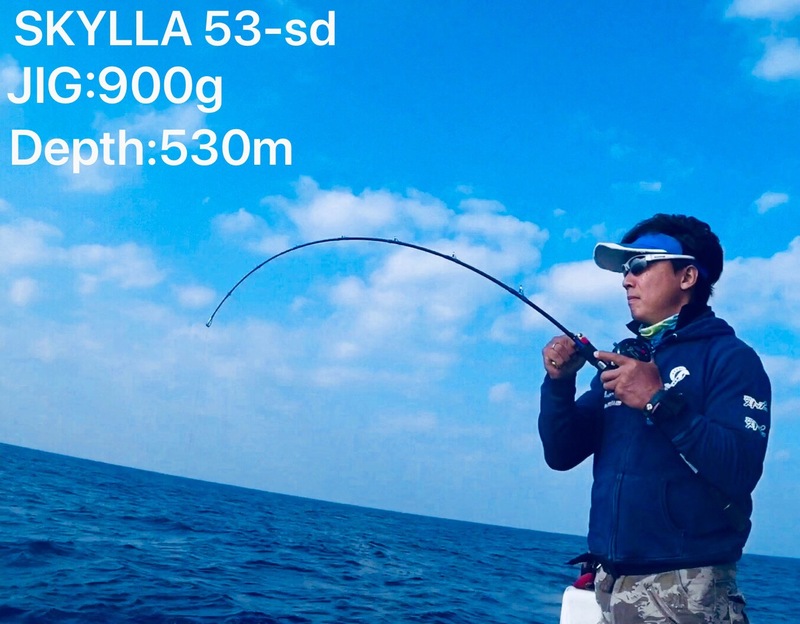 Skylla distinguishing feature is that it feels soft and smooth when lifted, but when the jig is in movement and causing water resistance, the rod shaft will produce the necessary torque energy to control the jig easily. A tough rod shaft combine with soft tip will enable the jig to move under control. You may associate tough with stiffness. In actual fact Skylla is a combination of soft and tough, cleverly matching pliable with strength. Skylla series consist of total 8 rods, from no. 00 to no. 5, and no. 53 for deep sea application. We have no intention for anglers to purchase so many rods, however we wish to advice anglers to fully understand the water depth and current they frequently fish in to decide and select the rods that suit these waters. Many anglers wish to conquer all fishing grounds with one rod, and this is not possible. Fishing with jig ultimately is pursuing a sense of excitement when a fish hits the jig. Can you feel the enjoyment of fighting a small fish with a super stiff rod? The softer a fishing rod display, the more sensitive the rod is. But this also means the rod lacks enough rebound force to manipulate heavy jig. On the other hand, a tough rod may be able to play various jig weight but it lacks in sensitivity and unable to transfer vibration signal effectively. Sensitivity is critical for us to feel the fish movement, water current intensity and more importantly the instance when a fish hits our jig. Without these information, we are as good as fishing blindly. 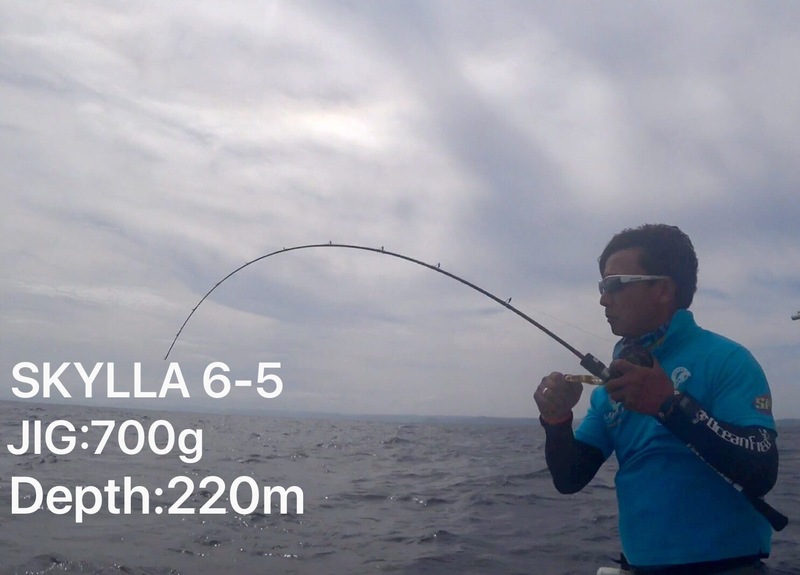 The selection of Skylla is based on the jig weight used. Depth of water determines the selection of jig weight, and this in turn determines the selection of rod number. We have placed no. 0 as our basic rod and it is suitable for 200g jig. So rod no. 1 for 300g jig, rod no. 2 for 400g jig, rod no. 3 for 500g jig, rod no. 4 for 600g jig, rod no. 5 for 700g and rod no. 53SD for all jigs above 700g. For rod no. 00, we have positioned it for slow and light jigging, suitable for jig between 80-150g. When you are able to touch bottom with the lightest jig weight, then utilising the corresponding rod no. will enable you to play and control the jig comfortably, irregardless of the intensity of the water current. 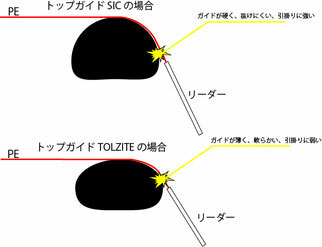 If the water current is strong, the tough rod shaft is able to control the jig. 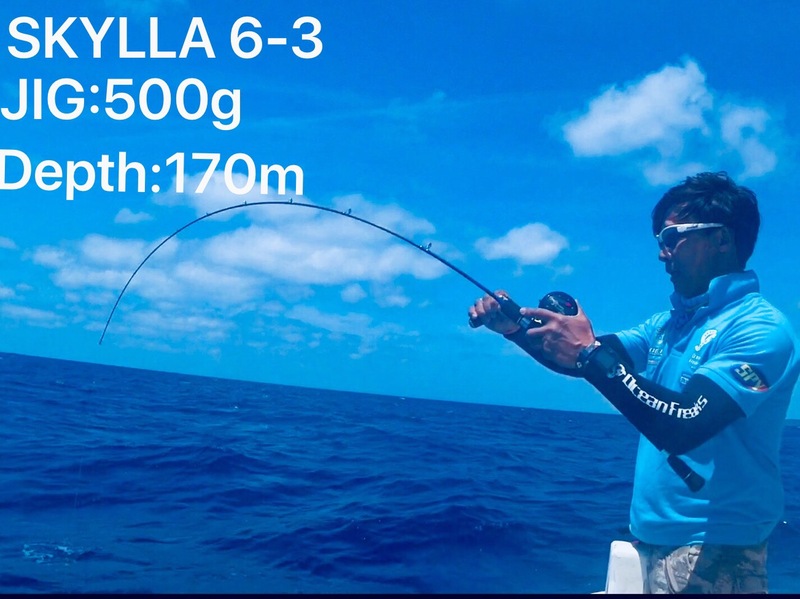 When there is no current, Skylla rod shaft can easily activate the jig, follow by utilising the soft rod tip to control the jig and prevent it from excessive movement. This is the essence of Skylla. We hope you have found the Skylla that best meet your needs for your fishing grounds, you will be surprised unexpectedly.